Leading our entry of Limousin bulls at the Carlisle show and sale was Newhouse Black Ivanhoe a Greenhaugh Forrester son out of Newhouse Flick he sold for 6200gns with a beef value of 51 and plenty of length he makes his way across the water to former beef farmer of the year Sam Chesney in Northern Ireland, also making 4200gns was Newhouse Ideal a Millington Ferrari son he heads to Nairn to the McArthur family of Budgate Farm. 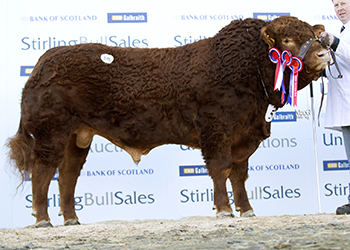 Despite what was a very steady trade at Stirling Bull Sales, we are pleased to have five bulls off to new homes with three selling to the Scottish Government Bull Stud. Top price of our consignment at Stirling was Newhouse Iceman at 5000gns. This July 2013-born Millington Ferrari son is out of the Hudscales Bigboy daughter Newhouse Elm. He was one of the Bull Stud’s purchases. The Bull Stud also paid 4000gns for Newhouse Insignia, another Ferrari son this time out of Newhouse Fay, a Bigboy daughter. Next best was the black Newhouse Black Ironman when he made 3800gns to C and J Carmichael, Isle of Lismore. He is by Greenhaugh Forester and out of Newhouse Bimbo, a Greenhaugh Utwo daughter. He carries a beef value of 38. Two bulls then traded at 3000gns, first up was the Ferrari son Newhouse Ironclad who sold to the Bull Stud. His dam is the Bigboy daughter Newhouse Dior and he carries a beef value of 48. Then Newhouse Inverness also found a new home at 3000gns with John Muirson from Forgandenny, Perth. Also by Ferrari he is out of Newhouse Dalulla, a Kype Vandamme daughter. He carries a beef value of 47. We’d like to thank all buyers for their custom. Leading trade for our offering of heifers in October at Stirling at 4100gns was Newhouse Black Happy. This December 2012-born heifer is by Greenhaugh Forrester and out of Newhouse Syrup, a Mapleleaf Jukebox daughter. She was purchased by W Paterson, The Golland Farm, Kinross. Next best at 3000gns was Newhouse Helena, a December 2012-born Rosecroft Duke daughter, her dam is the Grahams Trooper sired Newhouse Bella. Carrying a beef value of 35 she sold to Eileen Ritchie for her Ritchies herd at Whitecairns, Aberdeenshire. Two heifers found new homes at 1800gns, the first was Newhouse Harp, a Millington Ferrari daughter out of Newhouse Cila, a Greenhaugh Utwo daughter. This heifer carries a beef value of 36 and sold to David Dunnet. Then at the same money was the second place Newhouse Black Inesse who carries a beef value of 40. Born August 2013 this Millington Ferrari daughter is out of Newhouse Finesse, a Tamaravalley Boscastle daughter. She was purchased by D G Cunningham. Newhouse Iris and Newhouse Black Irishlass both made 1600gns. Iris is a Ferrari daughter out of the Greenhaugh Utwo daughter Newhouse Clover, she carries a beef value of 39 and sold to R W Cameron and Son. Irishlass is a Greenhaugh Forrester daughter out of the Greenhaugh Utwo sired dam Newhouse Bess. She sold to Messrs Mactier and Son. Our third prize winner Newhouse Issy found a new home with C and L Murphy at 1500gns. She is a Ferrari daughter out of Newhouse Fudge, a Rosecroft Duke daughter. She has a beef value of 40. Making the same money was Newhouse Isla, again by Ferrari she is out of a dam by Greenwood Poll Homerun and has a beef value of 39. She was purchased by W and M Linton and Son. At 1350gns was Newhouse Ina, a Ferrari daughter carrying a beef value of 44. Her dam is the Kype Vandamme daughter Newhouse Divine. She sold to Mr R D Cunningham. We would like to thank all purchasers and wish them all the best for the future. 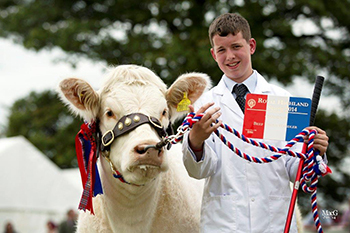 Andrew Adam wins beef young handlers Championship at the Royal Highland Show in the same week as he leaves school to start work on the family farm. We only had one entry forward at Carlisle this month for the Limousin sale which saw Newhouse Highflyer, a December 2012-born Rosecroft Duke son out of the Ronick Shapely daughter Newhouse Velma, sell for 3500gns. Buyer of this one was Patrick Dean, Bridge of Cally, Blairgowrie. We are pleased to announce the purchase of a third share in the 26,000gns Maerdy Hearthrob from Esmor Evans. This second prize winner was the only bull in the market that impressed us on conformation, with the added attraction of a tremendous pedigree to match. 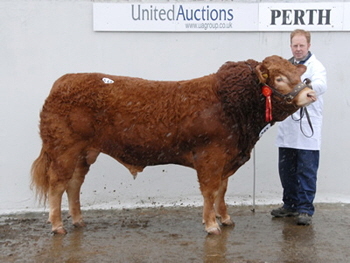 He was purchased for the top price of the day in partnership with Balmyle and Thrunton herds. Sired by Maerdy Dynamite he is out of Maerdy Beauty, a Maerdy Padirac daughter. Beauty was champion female at the Royal Show and interbreed champion at the Royal Welsh as an 18-month old heifer. He carries a TSI of +56, SRI of +50 with a calving ease figure of +4.6. 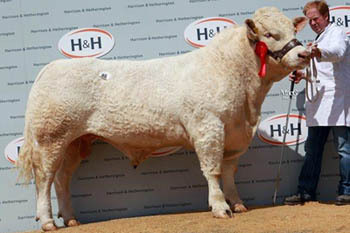 Andrew and James sold their July 2012-born Glamis Hercules at Stirling Bull Sales. Sired by Silver Joss he is out of Newhouse Babs, a Mowbraypark Torpedo daughter. He was knocked down at 3600gns to Culraven Farms, Twynholm, Kirkcudbright. It was a hectic time at Stirling with all nine bulls entered finding new homes. Leading the trade for us was Newhouse Hartley, a July 2012-born Rosecroft Duke son out of Newhouse Fay, a Hudscales Bigboy daughter. He stood second in the show and carries a beef value of +46, with +7.5 for muscle depth. He traded at 12,000gns to Robert Mcnee Ltd, Over Finlarg Farm, Tealing by Dundee. Then Mr J Mackay,Home Farm, Aberlour, Banffshire, paid 6400gns for the third prize winner Newhouse Hopscotch, sired by Millington Ferrari he is out of the Saturne daughter Newhouse Crocus. Our highest priced black bull was Newhouse Black Hoodlum at 4800gns. This Greenhaugh Forester son is out of the Tamarvalley Bocastle daughter Newhouse Elderberry. He sold to Huntlyhill Farms, Huntlyhill Mains, Lanark. Newhouse Hamish won his class and went on to be reserve junior champion, he is by Duke and out of Newhouse Della, a Hudscales Bigboy daughter. He has a muscle depth of +5.0 and sold for 4500gns to Terry Coghill for T and G Ritch, Langskaill, Birsay, Orkney. Two bulls sold at 3800gns, the first was Newhouse Black Humbug, who heads to Ardnamurchan Estates,Mingary House, Kilchoan,Acharacle, Argyll. 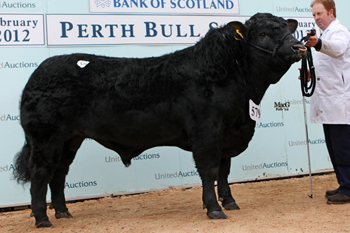 Then Newhouse Black Hercules who sold to K and B Lang, Starr Farm, Luthrie, Cupar. Both are sons of Greenhaugh Forester and out of dams by Tamarvalley Bocastle. Black Humbug is out of Newhouse Ekko and carries +6.5 for muscle depth, while Hercules is out of Newhouse Exotic and carries +5.9 for muscle depth. 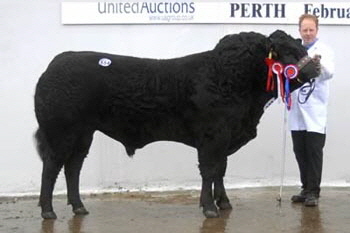 The similarly bred Newhouse Black Harvey sold at 3500gns to D and V Lyell, Auchleish Farm, Glen Quich, Memus. He is out of Newhouse Delores and carries a muscle depth figure of +6.7. We had two bulls who were unsold through the ring but found new homes outside. Newhouse Black Hocco is a Forester son out of Newhouse Star, a Maplelead Jukebox daughter. He has a muscle depth figure of +6.6 and sold to John Fleming, Castle Sinniness, Glen Luce, Newton Stewart, for 4500gns. Then at £3000 was Newhouse Hero, a Hudscales Bigboy son out of Newhouse Dior, a Bigboy daughter, he was purchased by E Scott, Linross Farm, Glamis,Forfar,Angus. We’d like to wish all the buyers of Newhouse bulls the very best with their purchasers and we look forward to hearing how their progeny perform. The offering of both Newhouse Charolais and Limousin females at the October sales at Stirling saw a top price of 4800gns. This was for our December 2011-born Charolais heifer Newhouse Gigi, she is by Silver Joss and out of the Solitude Attaboy daughter Newhouse Di. She was purchased by Messrs Middleton, Creevagh, Londonderry. 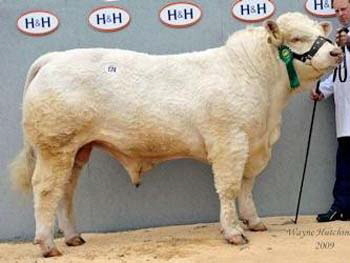 While our other Charolais heifer Newhouse Hilda sold for 2200gns to Messrs Kennedy, Glendarvel. This heifer is by Goldies Estate and out of Newhouse Tara, a Brampton Nacodar daughter. Top price for our Limousin heifers was our July 2012-born Rosecroft Duke daughter Newhouse Black Heidi. This red coated heifer is out of Newhouse Usabell, a Greenwood Poll Homerun daughter and sold for 3000gns to J and A Crawford, Bridge of Weir. Then making 2700gns was Newhouse Black Hannah, she is a black daughter of Greenhaugh Forester out of Newhouse Ebony, a Tamarvalley Bocastle daughter. She was purchased by Stuart MacTier, Newton Stewart, who also purchased Newhouse Black Gem for 1800gns. This Tamarvalley Boscastle daughter is out of Newhouse Ashley, a Newhouse Urbain daughter. Finally we sold Newhouse Hemma for 1500gns to B D and M S Hope, Canonbie. She is a Rosecroft Duke daughter out of the Kype Vandamee sired Newhouse Emma. We would like to wish all the purchasers all the best with their heifers. Demand for Newhouse Limousin bulls in Carlisle this month was strong. Sale leader from our offering was Newhouse Black Generallee at 5200gns. This Hudscales Bigboy son is out of Newhouse Cathy, a Kype Vandamme daughter. He carries a beef value of +44 and sold to R Laird, New Cumnock, Ayrshire. Our other bull Newhouse Gameboy was second in his class under judge Brian Baker. He is a Rosecroft Duke son out of another Kype Vandamme daughter, Newhouse Dixie and carries a beef value of +39. He was purchased by R Thornton and Son, Kirkwelpington, Newcastle-upon-Tyne for 5000gns. We wish both purchasers all the best with their bulls. 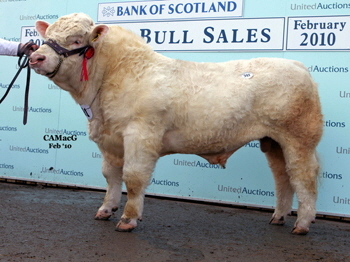 Having been impressed with him since we saw him shown as a yearling bull, we are delighted to announce our third share purchase in this month’s senior and overall Charolais champion at Stirling, Elgin Glenlivet, from the Milne family which was purchased by ourselves along with the Balthayock and Balmyle herds for the sale’s top price of the day, 28,000gns. Glenlivet is by Elgin Davinci and is out of the Harestone Tadorne daughter Corrie Debbie. He was a first prize winner and beef breeder champion at last summer’s Royal Highland Show and was also the Scottish Championship winner at Keith Show. He carries appositive calving ease figure, as well as a TSI of +53 and a SRI of +52. Elgin has arrived at Newhouse and we are thoroughly pleased with how he looks and can’t wait to see how he breeds for us in the future. At the same sale we sold the fifth prize and August 2011-born Newhouse Goldust for 4500gns to Messrs McBeath. By the 10,000gns Balmyle Churchill, who is owned in partnership with the Balthayock herd, he is out of the Balnuith Ringleader daughter Newhouse Vicky. He carries a TSI of +46 and a SRI of +47, along with a milk figure of +14. 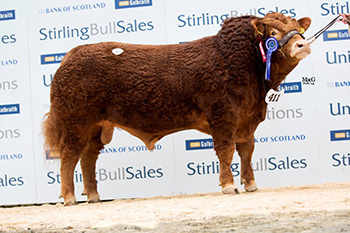 Limousin sale leader for us at Stirling this month was the July 2011-born Newhouse Black Gladstone, a red coated bull by our stock bull Hudscales Bigboy who was also awarded the junior and overall championship title under judge Willie McLaren. Gladstone is out of the Kype Vandamme daughter Newhouse Divine and carries a muscle figure of +5.9 and a beef value of +45. He later sold for 7000gns to Iain and Jen Wilkinson. We’d like to wish them the very best with the bull and look forward to seeing how his progeny perform in the future. Next up selling for us was the July 2011-born Newhouse Black Garibaldi, a Tamarvalley Boscastle son out of the Greenhaugh Utwo daughter Newhouse Carol. 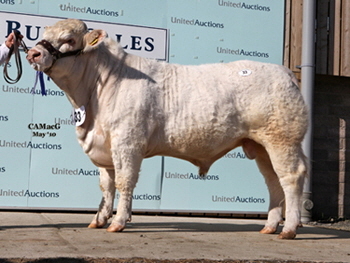 With a beef value of +41 and a muscle figure of +4.4, this one traded at 4200gns to Messrs Hodgson. Then at 3800gns was the red coated Newhouse Black Galahad, this time by Rosecroft Duke and out of the Greenhaugh Utwo daughter Newhouse Clover. He carries a beef value of +31 and found a new home with J W Kay and Co, The Gass. 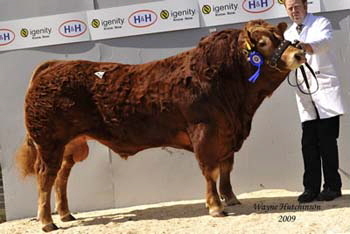 Then at 3500gns was the Hudscales Bigboy son Newhouse Gautier, a September 2011-born bull out of the Newhouse Nougat daughter Newhouse Tombola.He has a beef value of +34 and was knocked down to Messrs Fisher, Flathills. At 3200gns, Messrs Hodgson then bought another Boscastle son, this time the July 2011-born Newhouse Black Gothic. This one is out of the Mapleleaf Just So daughter Newhouse Vale and carries a beef value of +32. Then at 3000gns was Newhouse Black Glenclova, an August 2011-born Boscastle son out of another Newhouse Nougat daughter, this time Newhouse Tammy. Buyer here was R and S Slimon and Son. Then wrapping up proceedings for us selling at 2500gns was the red coated Newhouse Black Ganit, another Boscastle son out of the Greenhaugh Utwo daughter Newhouse Betty. With a beef value of +35, this one found a new home with Messrs R Bell. A top price of 5000gns was bid by new Young Breeder Andrew Morton from Lochend Farm, Carron Bridge, Denny, Stirlingshire, for the December 2010-born heifer Newhouse Black Folly. This heifer is by Tamarvalley Boscastle and is out of the Greenhaugh Utwo-sired Newhouse Black Ash and was offered in-calf to Balea BMW. We wish him all the best in his new venture. It’s been a busy month selling Charolais and Limousin bulls at Stirling and Carlisle and sale leader for us has been Newhouse Fourstar, a December 2010-born Sackville Claudius son out of the Brampton Nacodar daughter Newhouse Tora. With a milk figure of +12, a TSI of +63 and a SRI of +53, he sold to commercial breeder R Leiper, Newcastle upon Tyne. Also at the same sale, we sold Newhouse Figaro, another December 2010-born bull this time by Balmyle Churchill out of the Brampton Nacodar daughter Newhouse Tombola for 5000gns. He has a milk figure of +10 and a TSI of +43, while the boys sold their December 2010-born bull Glamis Fantastic by Sackville Claudius out of the Mowbraypark Torpedo daughter Newhouse Babs for 4000gns. 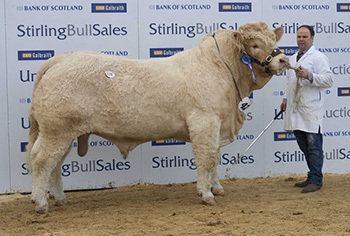 In Stirling this month, our Charolais bull Newhouse Festival by Sackville Claudius sold for 5400gns. With a TSI of +47 and a SRI of +31 he sold to J M More, Gargunnock, Stirling, while in Carlisle our Limousin bull Newhouse Black Fusilier, a Tamarvalley Boscastle son out of the Greenhaugh Utwo daughter Newhouse Cleo sold for 3000gns to S and T Evans, Carmarthen. 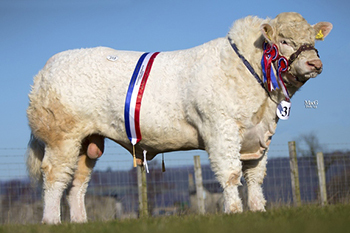 Selling to a top of 7500gns for our team of Charolais bulls in Stirling this month was Newhouse Fandango, a July 2010-born son of Balmyle Churchill out of the Balnuith Ringleader daughter Newhouse Vicky. He sold with a TSI of +40 and a SRI of +42 to A Coghill, Caithness. Next up were two bulls sharing a 7000gns price tag, the first of which was Newhouse Firefly, another July 2010-born son by Churchill, this time out of the Mowbraypark Torpedo daughter Newhouse Annie. With a milk figure of +8 and a TSI of +41, eh was knocked down to Dalhanna Farming Co, Castle Douglas. The other at this figure was Newhouse Flambeau, again by Churchill and out of the Sackville Adonis daughter Newhouse Claret. With a good set of figures including +10 for milk, a TSI of +42 and a SRI of +41, he went to Aucheneck Estates, Killearn, Glasgow. We then sold Newhouse Festin, a September 2010-born son of previous herd sire Sackville Claudius for 6500gns to McNeil Estates, Newton Stewart. This one is out of the Blelack Rustic daughter Newhouse Utopia. Then at 5200gnsNewhouse Firefox exchanged hands selling to the Crofters commission, Inverness. He is a July 2010-born son of Churchill again and is out of the Sackville Adonis daughter Newhouse Cory. Selling for 4000gns next was Newhouse Foremost, another Churchill son out of the Adonis daughter Newhouse Cedar. 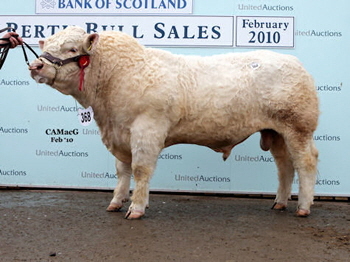 Buyer here was Messrs Walker, Duns, Berwickshire, while at 2800gns Newhouse Fugitive sold to CLB Ltd, Caithness. This one is another Churchill son out of the Brampton Nacodar daughter Newhouse Bossyboots. We’d like to wish all the buyers the very best with their purchasers and look forward to hearing how they perform for you in the future. 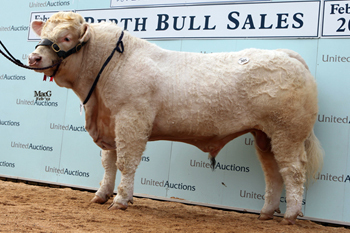 We’re pleased to announce the arrival of two new Charolais sires to the Newhouse herd purchased in Stirling this month at the Perth Bull Sales. 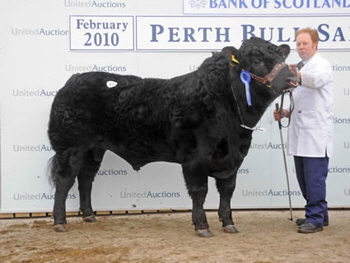 The first to be purchased at 22,000gns was the overall senior champion Blelack Forester, a March 2010-bull son of Meardy Dublin out of the Cargriff Victorious daughter Blelack Champers, who is one of the best female lines in the Blelack herd. With a TSI of +48 he has a SRI of +38 and was purchased in a three way partnership with ourselves and the Balthayock and Balmyle herds. 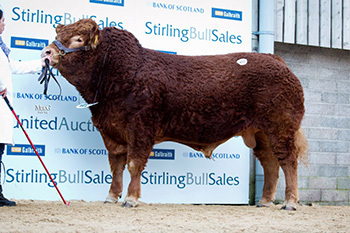 We then teamed up with the Thrunton herd of Messrs Campbell to purchase Laverock Fabio for 14,000gns. 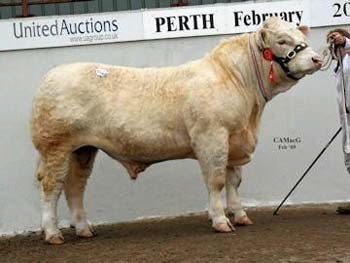 He is a May 2010-born Corrie Alan son out of the Laverock Jesmor daughter Laverock Video. This month’s Stirling Limousin sale will be remembered for some time to come as an amazing day. 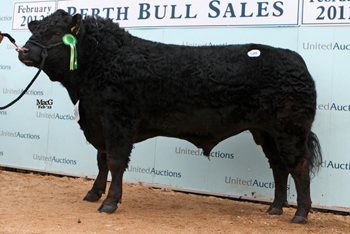 With nine bulls forward to sell we were delighted with our sale average of £8377 and sell to a top of 16,000gns. Our sale leader was Newhouse Black Fullback, a son of Tamarvalley Boscastle out of the Greenhaugh Utwo daughter Newhouse Bess. 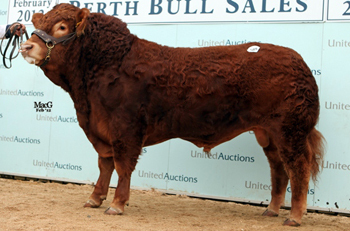 He sold with a beef value of +33 to Redpath Farms, Kelso, Roxburghshire. Next in the money was Newhouse Black Frisky, another son of Boscastle, this time out of the Greenwood Poll Homerun daughter Newhouse Cyrup. 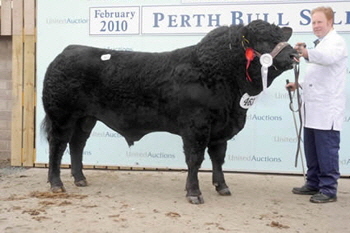 With a beef value of +55, he was knocked down at 15,000gns to Peter Alexander, Blairgowrie, Perth. 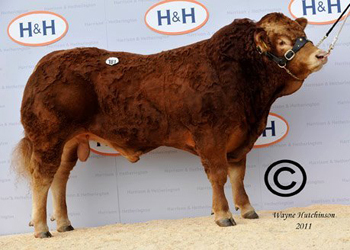 The Hudscales Bigboy son Newhouse Fabain topped the trade for our red Limousin offering. Out of the Newhouse Nougat daughter Newhouse Upright, he sold at 9000gns to Messrs A and R Paton, Avonbrige, Falkirk, while another Bigboy son, this time Newhouse Black Freelander out of the Ronick Shapely daughter Newhouse Vivian, sold for 8000gns to Messrs MacMillan, Ballygrant, Isle of Islay. He carries a muscle figure of +6.7 and a beef value of +51. Next up was the Greenhaugh Utwo son, Newhouse Black Festival. Who sold for 7500gns. He is out of one of our best breeding females, Newhouse Teak and carries a beef value of +34. He was knocked down to A L Jones, Gwynedd, Wales. At 5000gns, Gallagher Farms, Maidstone, Kent, then purchased Newhouse Fugitive, a Hudscales Bigboy son out of the Ronick Member-sired Newhouse Peach, while Newhouse Black Flint, by Boscastle out of a Greenhaugh Utwo daughter Newhouse Carol sold at 4500gns to D Brown and Co, Lockerbie, Dumfriesshire. We then got Newhouse Fopel, a Bigboy son out of the Vivaldi daughter Newhouse Copel, away at 3600gns to R H Kennedy, Isle of Bute, while the Crofters Commission, Inverness, paid 3200gns for Newhouse Fivestar, another Bigboy son out of the Lucky daughter Newhouse Oops. We’d like to thank all the purchasers on the day and wish them the very best with their new bulls and a big thank you to all our helpers at the sale. We’re pleased to announce the arrival of the March 2010-born Millington Ferrari to the sire line up at Newhouse. By Objat out of the Ronick Matador daughter Brockhurst Option, Ferrari was purchased in Carlisle from Millington Grange Estate for 10,000gns and has a beef value of +49. All the nine females that we took to Stirling this month were sold at the sale with the top price of the day being 2200gns for the Black Limousin heifer Newhouse Black Fleur, who is a daughter of Tamarvalley Boscastle and out of Newhouse Betty. She sold to the Evans family, Llan Ddarog, Camaerthan. 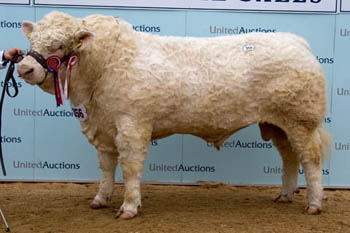 Our Charolais bull, Newhouse Fireball, by Sackville Claudius, sold for 3800 to Terry Coghill, Orkney. Our Charolais entry at Carlisle this month, Newhouse Firstfoot, stood second in his class under judge Will short of the Woodpark herd and sold for 6200gns to W R Simmers and Sons, Keith, Banffshire. This Balmyle Churchill son is out of Newhouse Tombola, a Brampton Nacodar daughter and has a TSI of +39 and an SRI of +49. Selling for 8000gns at the May Limousin sale in Carlisle was Newhouse Black Excalibur. This Tamarvalley Boscastle son is out of Newhouse Tee, dam of Newhouse Black Billy who sold to the Knock herd for 12,000gns. 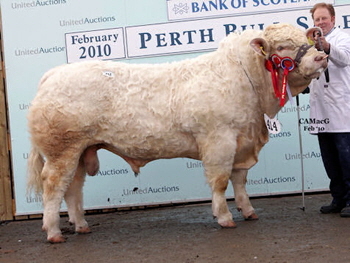 Excalibur sold with a beef value of +45 to G Yarr, Edzell, Brechin. Having been impressed with the first prize Goldies Estate from Hamish Goldie at Stirling this month, we were delighted to be able to secure him at 14,000gns in a joint partnership with Stuary Barclay’s Harestone herd. Born September 2009, this bull is a Thrunton Camelot son out of the Blelack Montgomery daughter Goldies Ursula. He has great growth for age, has good locomotion and has good figures to match. With a milk figure of +8, he also has a TSI of +31 and a SRI of +40. We look forward to seeing how he works in both herds. Having taken the intermediate and overall championship at Stirling this month, Newhouse Emperor then went on to sell for 13,000gns. By our past shared stock bull Solitude Attaboy, this July 2009-born bull is out of the Balnuith Ringleader daughter Newhouse Vicky, who is the dam of Newhouse Dingdong, intermediate and overall champion in February last year. Emperor has a milk figure of +11, TSI of +47 and a SRI of +58 and was knocked down to Jan Boomaars, Woldingham, Surrey, for his Vexour herd. Of the four Limousin bulls entered for Stirling in February, the string topped at 5000gns for the Black Limousin, Newhouse Black Espresso. 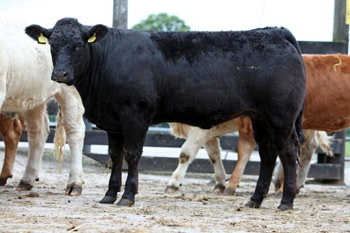 By our senior herd sire Tamarvalley Boscastle, this September 2009-born bull is out of the Hewsons Goldust daughter Newhouse Sue and sold with a beef value of +27 and a muscle score of +3.3 to A Strachan, Brechin, Angus. Another Black bull, this time Newhouse Black Eugene, an August-born bull sold for 3800gns to Genoch Mains Farms, Dunragit, Stranraer. Again by Boscastle, this one is out of the Greenhaugh Utwo daughter Newhouse Betty and had a beef value of +32 and a muscle score of +4.3. Our next best was Newhouse Black Emperor, a July 2009-born son of Boscastle again, this time out of a Mapleleaf Just So daughter, Newhouse Violet. 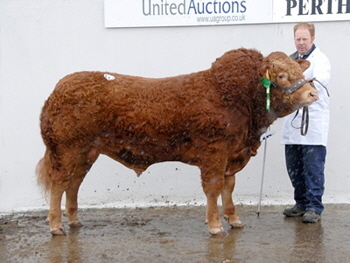 With a beef value of +25 and a muscle score of +3.4, he sold at 2600gns to Messrs MacMillan, Ballygrant, Isle of Islay. Our only red Limousin bull Newhouse Espoir, sold for 2400gns. This one is a son of our senior stock bull Kype Vandamme and is out of the Lucky daughter Newhouse Oops. He has a beef value of +37 and a muscle score of +4.8. Buyer here was J Killen, Blairdrummond, Stirling. We’d like to wish all buyers the very best of luck with their new purchases. The best of the females on offer from Newhouse at the Red Ladies Derby in Carlisle saw the Hudscales Bigboy daughter, Newhouse Dishy, sell for 3800gns. Out of the Grahams Trooper daughter Newhouse Beach, she sold to Stuart Fotheringham, Dunkeld, Perth. Taking the overall female championship at the Perth Limousin sale in Stirling and selling for 1850gns was Newhouse Eyeful. By our herd sire Hudscales Bigboy, this July 2009-born heifer is out of Newhouse Boops, who is a daughter of Kype Vandamme. She was knocked down to R J Lines, Argyll. At the same sale, the boys also took the reserve Charolais female spot with their own heifer Glamis Doris, by Solitude Attaboy. She sold to Gilbert Crawford of the Coolnaslee herd. At the May sale of Charolais bulls in Stirling, Newhouse took the reserve championship title with the 20-month old Newhouse Diamond. Sired by the 32,000gns Perth champion, Solitude Attaboy, and out of a homebred cow by the 24,000gns Mowbraypark Torpedo, he sold for 3800gns to G and M Porter, Bridgend, Isle of Islay. Leading our entry of Limousin bulls at the Society sale at Carlisle in May was the junior bull Newhouse Daddy who made 10,000gns to N and M McLellan, Kilchiaran, Port Charlotte, Isle of Islay. December 2008-born Daddy is the first son sold off our stock bull Hudscales Bigboy, a Gunnerfleet Talker son, who was purchased for 19,000gns in November 2007. Daddy is out of Newhouse Bessy, who features Grahams Samson in her pedigree. 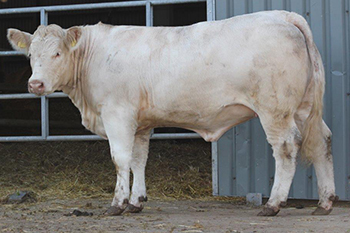 The February sale of Charolais bulls was one we will certainly not forget in a hurry. Having sold bulls at 22,000gns, 15,000gns, 14,000gns, 10,000gns, the Newhouse string averaged £12,110 for six sold. 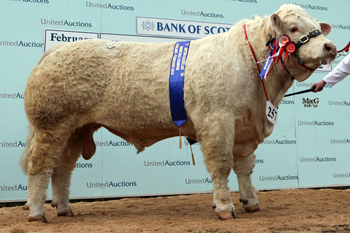 At 22,000gns was Newhouse Dingdong, which took the overall and intermediate championship titles in the pre-sale judging. Dingdong, who was shown for the first time, is by our senior herd sire Sackville Adonis, which has previously bred sons to 26,000gns for the Balmyle herd (joint owners). August 2008-born Dingdong is the first bull calf out of Newhouse Vicky, a Balnuith Ringleader daughter. 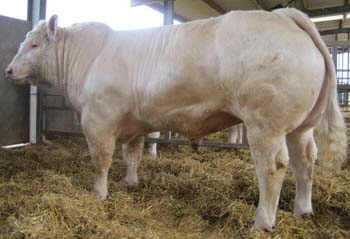 Pedigree breeder David Fattorini bought him for the Fairway herd, Tockwith, York. Next at 15,000gns was Newhouse Diablo. This July 2008-born bull, by one of our past stock sires Silver Joss, who was purchased for 30,000gns, took the reserve intermediate title. Diablo is out of a Blelack Rustic-bred dam, Newhouse Acorn. The hammer fell to a two-way partnership of J A S Warnock, Biggar, Lanarkshire, and J R Green, Melrose, Roxburghshire, both suckled calf producers. At 14,000gns we sold Newhouse Delboy, another Adonis son, again out of a Balnuith Ringleader-sired dam, Newhouse Vibe. Making the final bid was T A Jones and Son, Dryslwyn, Carmarthen. Next best for the Newhouse string was a call of 10,000gns for another Adonis son with Silver Joss as grandsire on the maternal side. Newhouse Demitri, a first prize winner, sold to James Webb, Billesdon, Leicestershire. The February Carlisle sale saw us sell Newhouse Dynamo, a son of Kype Vandamme out of Newhouse Talulla for 5600gns. He knocked down to commercial producer Peter Alexander, Blairgowrie, Perthshire. 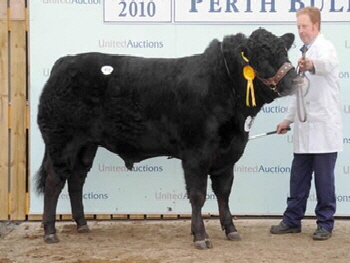 The Perth spring Limousin show and sale saw Newhouse top the trade twice with two Black Limousin bulls. It was a tremendous day for the family as we sold seven bulls to average of £8304 with a sales gross of £58,128. This was the second year that we topped the market, having sold Newhouse Black Colorado for 16,000gns at last year’s fixture. 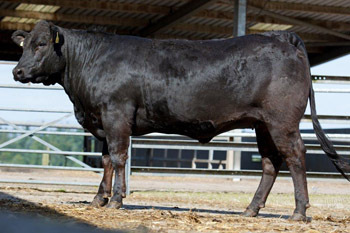 In 2009 it was Greenhaugh Utwo who was the sire, but this time it was Tamarvalley Boscastle who had sired all seven of the bulls forward. The first at 12,000gns was the reserve junior champion, Newhouse Black Dominator, who is out of the same dam, Newhouse Teak, as last year’s sale leader. 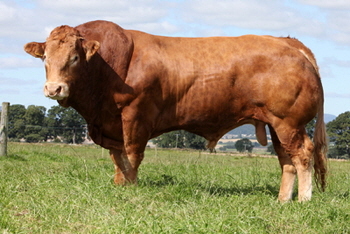 Carrying a Beef Value of LM+42, placing this July 2008-born bull in the top 1% of the Limousin breed, Dominator scaled 1020kg when going under the hammer to G MacGregor and Sons, Glenfarg, Perth, who runs a commercial herd comprising 200 mainly Limousin-cross cows. Also at 12,000gns - and again heading to a commercial buyer - was Newhouse Black Denver, a rising 19 month-old bull, again by Boscastle and out of the homebred dam, Newhouse Star. Sporting a beef Value of LM+35, purchaser was Corries Meats, Newtownards, Northern Ireland for their 270-strong Limousin suckler herd. Our third leading price was Newhouse Black Dakota at 9000gns, again by Boscastle but this time out of Newhouse Violet. This one had a Beef Value of LM+30 and was snapped up by B G and D E Marrs, Setmurthy, Cockermouth, Cumbria. 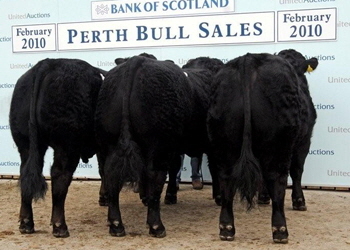 At the same sale we sold Newhouse Black Drew at 6000gns and Newhouse Black Dakar at 5800gns both to MacFarlane Farms Ltd, Duns, Berwick, while Newhouse Black Desperado was knocked down at 5800gns to Kirk and Calvert Smith, Campbelltown, Argyll. Having had the pleasure of judging the junior interbreed at this year’s Royal Welsh Show, Bob particularly liked a Limousin bull Rosecroft Duke, from Collumpton, Devon-based David and Anne Wheeler. Having admired him in the show ring, he followed it up with a herd visit to see the dam and the bull’s sisters before buying him privately. Duke has been used in the herd and we’re incredibly pleased with his progeny to date. We enjoyed a fine day’s trading at Carlisle in May with Newhouse Cyclone selling for 13,800gns. By the French AI sire Vivaldi and out of the Rombalds Pedro daughter Newhouse Tramp, Cyclone sold with a Beef Value of LM+52, the highest figures in the catalogue. In the show ring, this stylish bull had stood second in his class to the Overall Supreme Champion. Purchaser was Jonathan Watson for his Tweeddale pedigree herd at Berwick-Upon-Tweed, Northumberland. Later in the day the same herd sold the December 2007 born Kype Vandamme son, Newhouse Castoff, for 9000gns to the Reddings pedigree herd of N P Wilson, Reddings, Moffatt, Dumfriesshire. At 5200gns Newhouse Dimitri then sold to a commercial producer. Our sole entry at a fantastic Carlisle sale in May (which saw a new record sent at the sale) was the 18,000gns Newhouse Debonair, who sold to neighbouring breeders, P Cooper and Son, Kincaldrum, Forfar. The January 2008-born Debonair is by our senior stock sire, the 14,000gns Sackville Adonis and out of home-bred dam by Blelack Rustic. Having had such great success with Sackville Adonis, February this year saw us purchase Sackville Claudius for 18,000gns from Brian and Peter Heath, East Sussex, in partnership with Bill Bruce’s Balmyle herd, Meigle, Perthshire. Claudius is by Doonally Souverain and out of Sackville Sapphire, which is the dam of Sackville Adonis, which we previously bought in partnership with Balmyle for 14,000gns at Carlisle in 2006. 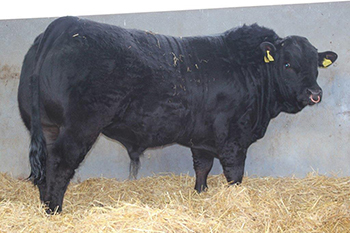 The Perth Spring Limousin Show and Sale saw Newhouse Black Colorado become the first black Limousin to be crowned champion at a British Limousin Cattle Society Show and Sale. 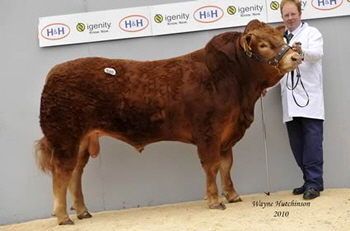 Sired by Greenhaugh Utwo and out of the home bred dam, Newhouse Teak, Colorado carried a Beef Value of LM+38, placing this August 2007-born bull in the top 1% of the Limousin breed. 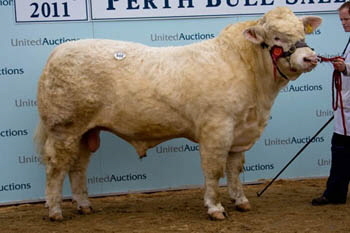 Greenhaugh Utwo was bred by Keith Stewart, Aberdeenshire and used as the Adams’ stock bull for two years, before he was sold to Christopher Dunphie, Wester Cloquhat, Bridge of Cally, Blairgowrie. 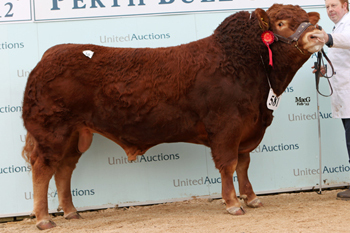 Over the previous two years at the Perth February sale, Greenhaugh Utwo, an SLVL Beef grandson, has demonstrated his commercial worth, siring the second leading price of 12,000gns for Newhouse Black Billy in 2008 and the two top prices in 2007 – the 16,000gns Newhouse Black Angus and the 12,000gns Newhouse Black Alfy. We also picked up the day’s second top price of 11,000gns for the classy Newhouse Casino and enjoyed an excellent day’s trade with further bulls at 9000gns, 8000gns, 5500gns and 5200gns. Newhouse Casino at 11,000gns is by the herd’s stock bull Kype Vandamme, a Cloughhead Lord son who was purchased at Carlisle for 13,000gns in October 2005, and is out of Newhouse Alice. 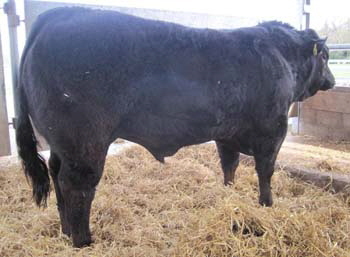 This August 2008-born bull’s figures matched his looks with a Beef Value of LM+40 and a muscle score of +4.90 complemented with a calving value of LM+2C. New owner is Allan Moore Ltd, Drummond, Evanton, Inverness. Newhouse Cavalier, also by Kype Vandamme and this time out of Newhouse Talulla, sold at 8000gns. Cavalier has a muscle depth of +5.90 and a Beef Value of LM+39 and heads to R Edward and Sons, Haddington, East Lothian.